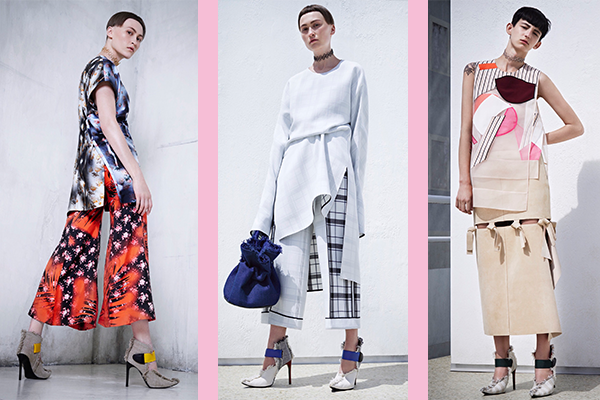 Acne’s Resort collection was filled with so much detail, it was hard for me to pick my favorite looks. There was a play with silhouettes, like a gorgeous white trench with oversized pockets (below, row 2, pic 2), a pant suit with a long robe-style jacket over cropped trousers (row 2, pic 1), to a fitted cropped top over a button down shirt, paired with a short skirt bearing long side panels (row 2, pic 3). Knotted fabric detail embellished a dress, tying the top to the bottom of it, while an interesting geometric pattern accented the front of top (below, row 1, pic 3). A mix of textures came into play brilliantly, in the pants above, with a shorts-pant hybrid in a striped pattern, covered in sheer fabric on one side, while attached to see-through long pants decorated with different colored geometric shapes, in both sheer + opaque fabrics. Austin Tx! Just wanted to mention keep up the good work! skilled blogger. I have joined your rss feed and look forward to looking for extra of your great post.